On Friday, November 10, 2006, Jason Filipow (aka The Obey Bachelor and part-owner of Studio Number One), posted the following in his thread at TheGiant.Org: BLOG- Started rocking the large Basle canvas this afternoon....8'x 10' is the largest 'freestanding' work we have ever done. The intent is to have the surface collage be as dense and interesting as the smaller (2'x3') paper one-offs. It will no doubtedly be a busy weekend for both of us as we need to cut eight foot tall stencils for this thing. I may post a photo or two of an in-progress view on this here thread sometime on Sunday. This was followed-up with another post on Saturday, November 11, 2006: BLOG--- Still thrashing on the large canvas. Hey, it's Saturday! But I am working- again. BOOOOO! Anyway, Shepard has finished the portrait/illustration which will be the focal point of this thing and he is at 'the local copy center' right now making the oversize copies that he'll be turning into stencil. I'll be continuing to fine tune the background elements and we will probably begin the stencil applications tomorrow. I shot the first few photos of the collage in progress today and I am really stoked on it. (Someone needs to tell me how to post photo files on this thread, b/c I can't figure it out.) Hopefully, Shepard will give me permission to post a few of the in progress shots, and I think a few of them would be perfect as downloadable digital desktops (as I have mentioned doing before). In subsequent posts, Filipow followed up with a series of pictures of the in-progress Basel Canvas. He also reported that there were no immediate plans to make a print edition of the image. 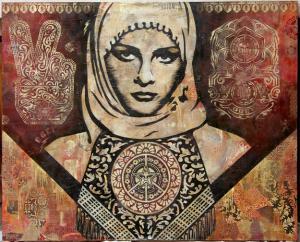 Later (11/26/2006), Filipow reported that Obey will release a print based on the Basel Canvas (aka Arab Woman). It was a two-color, vertical format screenprint and was made available in December 2006. More details on the print can be found here: Arab Woman. 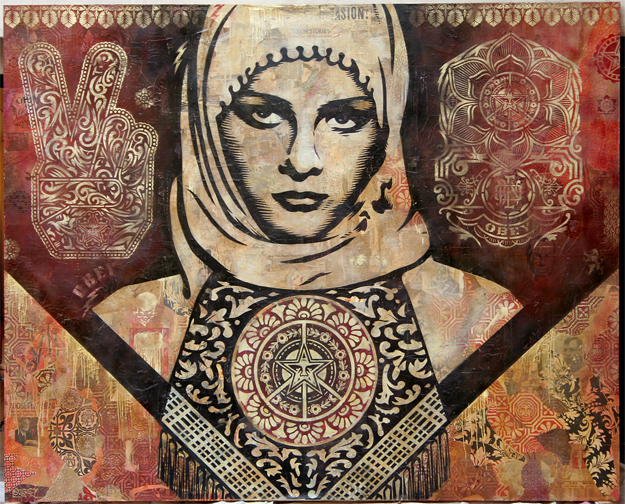 A second version of this print, called Arab Woman Gold was also released on ObeyGiant.com.